How much does it cost to travel to Glasgow? How much money will you need in Glasgow? £101 ($131) is the average daily price for traveling in Glasgow. The average price of food for one day is £33 ($43). The average price of a hotel for a couple is £101 ($131). Additional pricing is in the table below. These average travel prices have been collected from other travelers to help you plan your own travel budget. How much money do I need for Glasgow? Glasgow is the biggest city in Scotland with a population of about 600,000 and more than 2 million in the surrounding areas. It is located on the edge of River Clyde and has long been acclaimed as Scotland's main industrial city. It remains a major economic center for the United Kingdom outside of London. In recent years it has also been awarded the European titles as both the City of Culture as well as the City of Architecture and Design. It's grown in popularity among tourists and is currently one of the most frequently visited cities in the British Isles. There are many museums, wonderful shopping, and easy access to the Highlands. Glasgow's climate is considered oceanic and it is on of Scotland's milder cities because of the influence of the Gulf Stream. There are less obvious seasons in Glasgow but winters are cool and cloudy, spring is mild and pleasant, summer is relatively cool and damp and fall remains pleasant in temperature. Winter temperatures average about 5 degrees Celsius although it is not uncommon for it to drop below freezing. Snow may occur, but it usually doesn't last long. The highs during the summer average around 20 degrees Celsius and it is usually quite wet. Popular architectural sights around the city include Glasgow Cathedral, the City Chambers, Glasgow Cross, St Enoch Subway Station, Glasgow Central Station, Willow Tea Rooms, Glasgow School of Art and Mitchell Library, among many other sights. 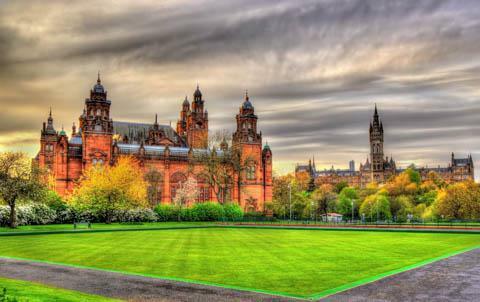 Interesting museums and galleries around town include the Burrell Collection, the Gallery of Modern Art, the Glasgow Police Museum, the Glasgow Science Centre, Hunterian Museum and Art Gallery, and Kelvingrove Art Gallery and Museum. Popular parks are Bellahouston Park, the Botanical Gardens, Glasgow Green, Kelvingrove Park, Mugdock Park, Queen's Park and Victoria Park. As a tourist, central Glasgow is where you'll likely spend most of your time. There are two main areas that you'll be interested in. The City Centre is where you'll find most of the tourist attractions as well as some of the city's best shopping and entertainment. This is also the commercial heart of the city. The West End is the bohemian area of town. This is where you'll find some interesting restaurants, cafes and bars. Most of these are concentrated around the University of Glasgow and the Kelvingrove Museum. If you want to enjoy a nice view of the city then head to the "drumlins" or hills. Outside of the City Centre, the East End is near Gallowgate and London Road. The South Side is to the south of the River Clyde and the North Side is to the north of the central part of town. Also of interest is the area along the banks of the River Clyde that is west of the City Centre. This is an old industrial area that is being revitalized and now has the Clyde Auditorium, the Science Centre and the Riverside Museum. Don't pass up Glasgow's music scene which offers the opportunity to see many up and coming bands and attend some well respected music festivals. There are also many opportunities to experience the art and theater scene in this cultural city. Food in Glasgow is very good. The city has won the title as "Curry Capital of Britain" for two years. It has a diversity of restaurants that include Indian, local, and international. If you're on a budget but then there are plenty of takeaway options. Indian, pizza, kebabs, fish and chips, and burgers are all good options. Some takeaway restaurants offer a unique mix of flavors such as chips with curry sauce or doner kebab pizza. Fish and Chips is a local favorite and you can easily find this option almost anywhere. You should definitely try Indian food while you're in Glasgow. In the past you would find most of the city's Indian restaurants in the Charing Cross area, just past the main part of Sauchiehall Street, but recently the Merchant City has added many options as well. If you plan to stay in Glasgow's city center, then you will find getting around relatively easy. The area is very compact and pedestrian friendly, with many shopping streets that welcome foot traffic. If you're heading outside of the city center there is a subway. It covers the city center and inner suburbs, giving you access to the West End, Glasgow University, and Ibrox Stadium. You can expect to pay about £1.20 for a ride or £3.50 for a day's pass. Suburban trains go from the Central and Queen Street stations into the suburbs and some nearby towns. It is a large system but infrequent on some routes, with only two trains running every hour. Buses go everywhere and routes typically run every ten minutes during the day. Traveling by bus during the evening hours is much more difficult as there are far less buses. A major appeal in Glasgow is the music scene. There are tons of popular venues where you can check out a new or popular band while in town. Among the best known venues are the Barrowlands or King' Tuts, where you'll see there top bands, but you'll have to wait in line. Also consider heading to Nice 'n' Sleazy on Sauchiehall St, Maggie May's, or the Cathouse.